Gotham will offer RED Open Plays throughout the Spring season around the first Monday of each month. 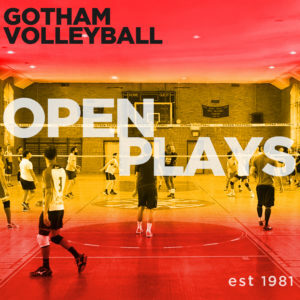 This Open Play is for players in Gotham Volleyball Divisions 1-3, Power A or B, NAGVA BB or A rated players, and other non-Gotham players who play at an advanced level. Registration will open two Fridays before the date of the Open Play, at 12:00 noon. Once registration opens, a section will appear at the bottom of this page. To register, just enter the required information, then click the “Buy Now” button. TBD: At this time, we have suspended Red Open Plays while we evaluate options to create a better offering. Stay tuned! Note: Locations subject to change depending on the availability of our facilities.